Ken Lambla, AIA, is Dean of the College of Arts + Architecture, UNC Charlotte, where he has been on the faculty since 1983. 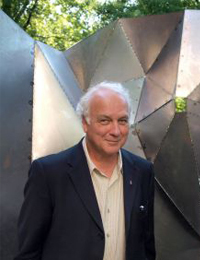 He received his Bachelor of Environmental Design degree from the University of Kansas and his Master of Architecture degree from the University of California, Berkeley. Additionally, he studied urban planning and law at UNC Chapel Hill. His career in both education and practice is focused on architecture and the arts as forms of community development and advocates social responsibility, craft, and innovation. Lambla has taught in Illinois, California, the United Kingdom (London), Italy, The Netherlands, France, Canada, and North Carolina. His teaching has focused on architectural design, design process/creative leadership, and social histories connecting art, design, and visual and performing arts as critical to cultural representation. He has worked as an architect and urban designer in Belfast (Northern Ireland), Chicago, San Francisco, and during his tenure at UNC Charlotte throughout North Carolina on educational and institutional projects. His research has focused on social histories of housing projects completed in Chicago and Rotterdam, The Netherlands. In Charlotte he is on the National Advisory Board of the McColl Center for Visual Art, Historical Elizabeth Neighborhood Foundation, and the board of the North Carolina Dance Theatre and has worked on projects with the Mint Museum, the ASC Task Force for Spirit Square, the Levine Museum of the New South, Charlotte Teachers Institute, Bechtler Museum of Modern Art Programming Committee, and helped produce Violins of Hope, a cross-community cultural project focused on the North American premiere exhibition of violins with histories connected to the Holocaust.